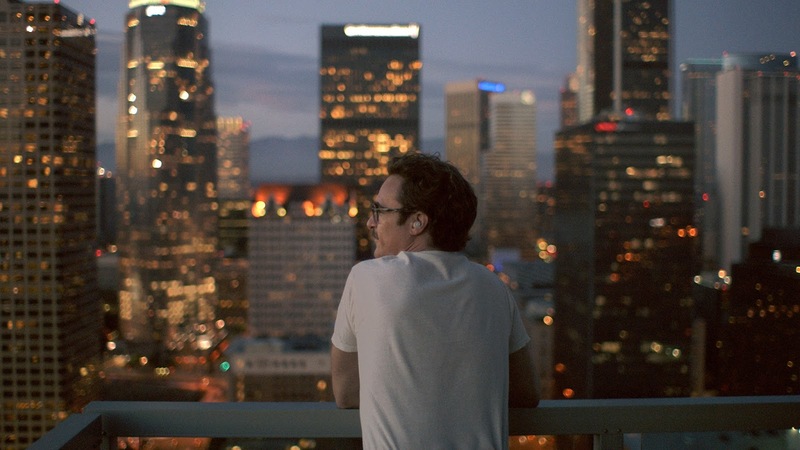 For the first hour of Her, Jonze lulls us into a sense that Theodore and Samantha's relationship could just be another example of a "whatever floats your boat" perspective that has become particularly ubiquitous among self-absorbed millennials. In presenting the only nearly futuristic world Theodore lives in, Jonze applies a color palette and aesthetic lifted from the clean-looking ads one has seen from as far back as late 80s United Color of Bennetton to Apple in more recent times. Bright, fluorescent colors are interspersed with ruddier, earth tones and metallic buildings made of glass reflecting neon commercial displays. Theodore's Los Angeles had to be filmed mostly in Shanghai in order to properly illustrate a city overtaken by skyscrapers. Theodore's own dwelling is located in Beverly Wilshire City, an allusion to the famed LA hotel and the extent that commercialism has merged with daily life. 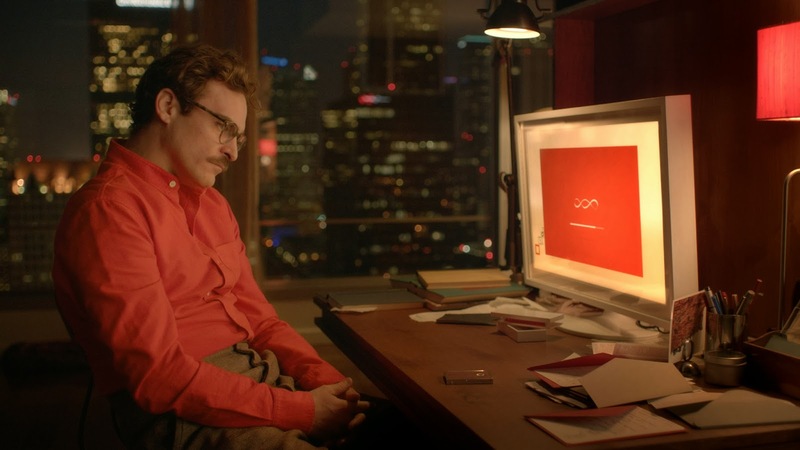 In Her, unbridled capitalism contributes to the compartmentalization of the individual, both internally and externally, providing Jonze a comfortable, attractive touchstone which the movie's audience can still be drawn to. For instance, the thought "Wouldn't it be cool if that were a real business?" will cross your mind, however briefly, when you find out what Theodore does for a living. As Letter Writer #612 for BeautifulHandwrittenLetters.com, he drafts personalized missives from clients to their loved ones. If one doesn't immediately grasp the scope of the depersonalization that represents it is because Theodore, a man still mourning the end of his marriage to Catherine (Rooney Mara), pours his every ounce of feeling into each highly individualized note of congratulations, condolences and the like. And Jonze floods the moments in between with intimate flashbacks of Catherine and Theodore in happier times, canoodling in bed, walking in a beautiful field, even bickering and wrestling in the charming way lovers do. Jonze also gives us these lover's moments between Samantha and Theodore, as he carries her in his pocket on a mobile device that allows her to see the world's wonders along with him. Walking on the beach, spinning around at a carnival, spying the magical moves of a street dancer, vacationing in Catalina Island with a co-worker (Chris Pratt) and his flesh-and-blood girlfriend, all are just occasions for Samantha to self-actualize and bond with Theodore. The comment by Amy that opens this review is simply another way of saying what the audience is thinking about the movie's main contrivance halfway in, "Sure, I could see this happen, and I'm okay with it." That is why what Jonze does with all the goodwill he's built up in the first hour of Her is so fascinating. 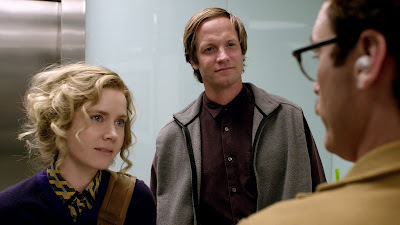 Amy's innocuous comment, one which solidifies our suspension of disbelief midway in the movie, precedes a crucial pivot point that leads to the second hour, one in which Jonze begins to tear down all of the misconceptions he's allowed us to build about the healthiness of Theodore's relationship. One last meeting between Catherine and Theodore to finalize their divorce lands the first solid blow to the fragile construction that is Theodore's new relationship with Samantha. "You're dating your computer? ...You always wanted to have a wife without the challenges of actually dealing with anything real." Here we begin to see how easy it is for Theodore to have fooled himself into thinking that anything lasting could develop from a relationship with an operating system. With memories as ephemeral as they are, will his flashbacks to his time with Samantha ever express themselves as anything more substantial than masturbatory dreams? Certainly without a physical presence as haunting as Catherine's, the fleeting idea of Samantha starts feeling even more gossamer. Jonze illustrates how important it is for love to be tethered to reality in order to counteract its inherit transience. Romantic as Her feels, it's also a bit disturbing. fascinating indeed. i also thought the gender roles were very indicative to today's culture and how one perceives another.